Above: Robert Lowery in a publicity still for the serial The Monster and the Ape (Columbia, 1945). 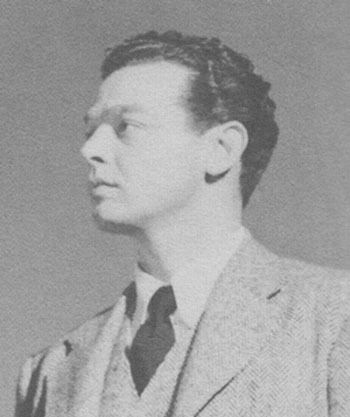 Robert Lowery was a first-rate chapterplay leading man on all counts; handsome and athletic, with a smooth but strong speaking voice, he was able to convincingly convey shrewdness, calm authoritativeness, and tough determination–and was also able to balance these serious qualities with a low-key, offhanded cheerfulness. However, few serial buffs have ranked Lowery very highly among chapterplay stars, despite his eminent suitability to the genre; his cliffhanging vehicles, rather than his own performances in them, are largely responsible for his frequent relegation to the also-ran list in overviews of serial heroes. Robert Lowery was born Robert Larkin Hanks in Kansas City, Missouri; he excelled in athletics during his high school years, and also studied singing (probably at the prompting of his mother, a former concert pianist). After his graduation (circa 1930), he sang with a couple of Kansas City bands and played minor-league baseball with the Kansas City Blues, until being sidelined by a severe injury. 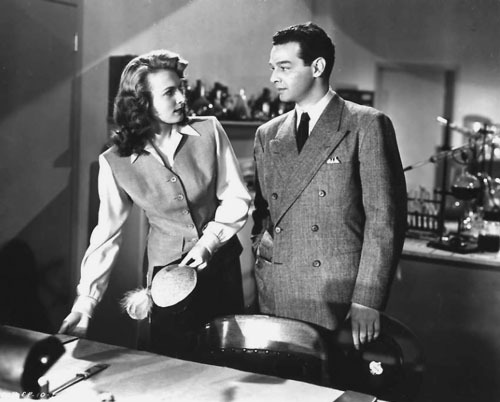 After the 1935 passing of his father (a Kansas City lawyer), he and his mother moved to California, hoping to parlay Robert’s good looks and athleticism into a movie career; after taking some acting lessons, doing a bit of West Coast stage work, and playing a few film bit parts, young Hanks was “discovered” and signed to a contract by Twentieth-Century Fox in 1937 (he presumably adopted his screen name around this time). Fox cast Lowery in many minor film roles in 1937 and 1938, and used him frequently in screen tests opposite aspiring starlets, but didn’t start giving him on-screen billing on a regular basis until 1939; from that year through 1942, he received many credited co-starring and supporting parts at Fox, in both B features (principally mysteries and romantic dramas) and A features (including Drums Along the Mohawk and Mark of Zorro). 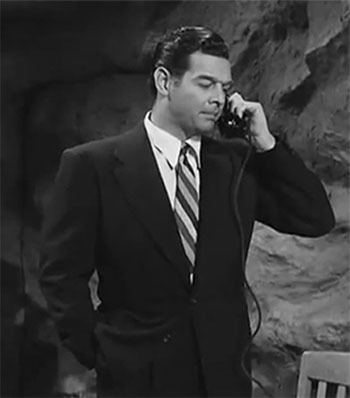 Lowery left Fox to freelance in 1942, and found steady work as a leading man in B-level mysteries, dramas, and adventure films for small studios like Monogram, Columbia, Republic, Universal, and (particularly) Pine-Thomas; over the next four years, he divided his acting time between these outfits’ features and training movies for the US Army (which he joined in 1943, only to be put on part-time film-making duty). One of his Universal screen assignments during the war years was the 1944 serial The Mystery of the Riverboat, the first and best of his three chapterplay outings. Set in Louisiana, this serial dealt with a struggle for possession of a stretch of apparently worthless but actually oil-rich swampland, which was co-owned by three old Acadian families and coveted by a band of profiteers who knew of its hidden value. Lowery was cast as Riverboat‘s chief protagonist, Steve Langtry–a lawyer, a member of one of the three land-holding families, and the leader in the landholders’ struggle to protect their property and discover the reason for the land-grabbers’ attacks. An involving and solidly entertaining chapterplay, Riverboat required Lowery to share screen time with a large and strong supporting cast, but still gave him more of an acting showcase than either of his two subsequent serials; his part allowed him to not only register standard heroic forcefulness and determination, but also offered him many good opportunities to be affable (when interacting with Langtry’s many friends and neighbors), shrewd (when inquiring into the mysteries surrounding the swampland and its owners), earnestly indignant (when reacting to the villains’ legal and extra-legal acts of chicanery) and even boisterously enthusiastic (when rejoicing over the Acadians’ eventual success in sinking their own oil well). Unfortunately, Riverboat’s down-to-earth plot and generally non-fantastic tone have kept it from getting much attention from serial buffs; as a result, Lowery’s best chapterplay outing is also his least-remembered. 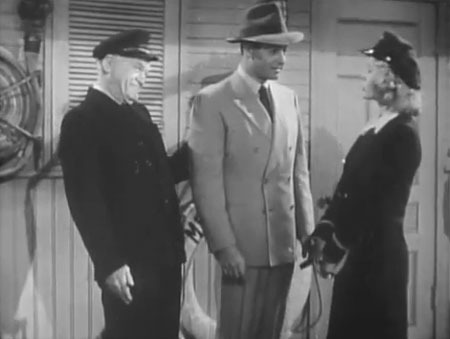 Above: Robert Lowery cheerily teases childhood friend (and eventually romantic interest) Marjorie Clements, to the amusement of her father Oscar O’Shea, in Mystery of the Riverboat (Universal, 1944). 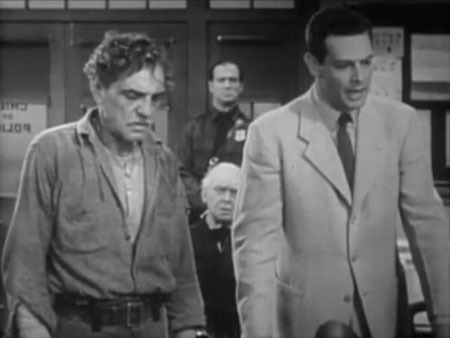 Above: Robert Lowery vigorously makes his legal case against the villains in Mystery of the Riverboat, with captured henchman and reluctant witness Francis McDonald beside him; Oscar O’Shea is seated behind McDonald and Lowery. In 1945, Lowery made his second serial, Columbia Pictures’ The Monster and the Ape. This chapterplay should have been a good one, featuring as it did an excellent cast and a good basic storyline (a battle for control of a powerful robot)–but instead proved to be a highly uninteresting outing, due mainly to a slow pace and a screenplay that was not only weak and undeveloped, but was also fatally lacking in any sense of suspense or urgency. Lowery, as the serial’s hero (corporate investigator Ken Morgan), did give his character an appropriately astute and self-assured demeanor, while conveying his usual quiet cheerfulness; he also retained an admirable seriousness even when battling the comically anthropomorphic ape of the title. However, neither he nor a talented group of co-stars (which included Ralph Morgan and George Macready) were able to save the anemic production. Above: Robert Lowery with leading lady Carole Mathews in The Monster and the Ape (Columbia, 1945). 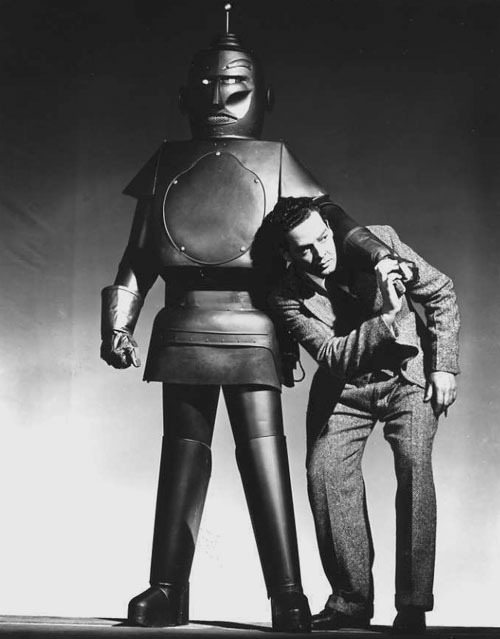 Above: Robert Lowery is attacked by the “Monster” of The Monster and the Ape, the robotic Metallogen Man, in a publicity still. Lowery kept playing leading roles in Universal, Columbia, and Pine-Thomas B-movies during the post-war years of the 1940s; he also appeared frequently in the B-films of independent producer Thomas Lippert, and did some stage work on both the East and West Coasts. In 1949, he starred in his third, final, and most famous serial: Batman and Robin, produced by Sam Katzman for Columbia Pictures. Though not as weak as Monster and the Ape, this comic-book adaptation was still a sub-par effort, hampered as it was by a severely padded and occasionally illogical plot; its low budget, graphically underlined by Lowery’s comically ill-fitting and shoddy-looking Batman costume, also worked against it. However, though Lowery frequently looked absurd in this serial, he played both Batman and his alter ego Bruce Wayne with conviction, and turned in a fine performance worthy of a better setting. He made the Caped Crusader seem both suavely intelligent and grimly authoritative, and adopted a listless but wryly humorous demeanor when playing the wealthy idler Wayne; his undercover pose as a hard-boiled crook in one chapter was also quite good. 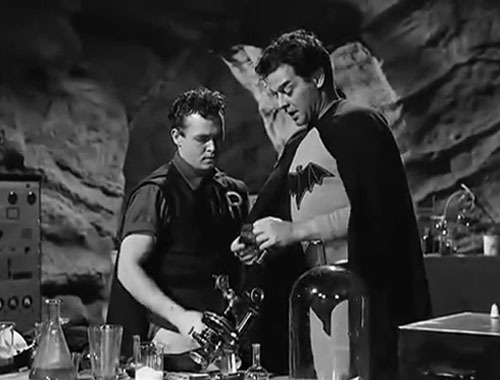 Above: Robert Lowery and John Duncan as Batman and Robin (Columbia, 1949). 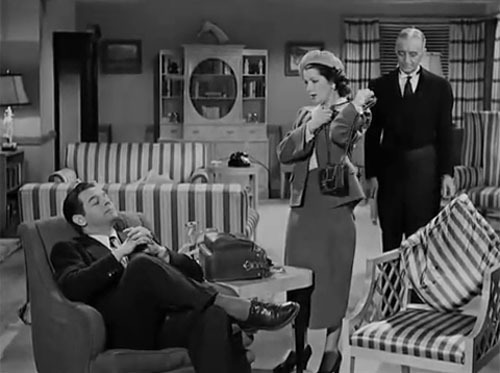 Above: Jane Adams as Vicki Vale takes an irritated leave of Robert Lowery’s happily lackadaisical Bruce Wayne in Batman and Robin (Columbia, 1949); Eric Wilton (as Alfred) is in the background. Lowery made about a dozen more features for Lippert, Pine-Thomas, Republic, and Allied Artists (the former Monogram) during the first half of the 1950s, and also began making frequent TV appearances; he kept doing stage work as well, and eventually opened his own dramatic school. Although some of Lowery’s 1950s screen roles were sympathetic ones, many of them were villainous; as the decade continued, he smoothly transitioned into a new acting career as an urbane heavy, principally on television. He returned to heroism on the 1956-1957 TV series Circus Boy, playing the co-starring role of frontier circus owner “Big Tim” Champion–but followed this show with a long string of memorably slick and shifty villainous guest performances on virtually all of the major Western and detective series of the late 1950s and early 1960s; his more scattered feature-film roles during this period were mostly in the same untrustworthy vein. His film and television appearances began to slack off during the mid-1960s; he ultimately wrapped up his screen career as a recurring antagonist on the short-lived 1967 Western/comedy show Pistols ‘n’ Petticoats. He continued to live in Hollywood after his retirement, and died of a heart attack towards the end of 1971. None of Robert Lowery’s three cliffhanging efforts–the well-done but unspectacular Mystery of the Riverboat, the dreary Monster and the Ape, and the high-profile but disappointing Batman and Robin–were the kind of serial that wins an actor a loyal fan following; in some quarters of serial fandom, he’s even acquired something of a negative reputation, due mainly to the combined mediocrity and prominence of Batman and Robin (one of the only Columbia serials to receive a genuine home video release). However, this reputation is completely undeserved; flawed as two-thirds of Lowery’s serials were, he himself was never one of their flaws. Instead, his understated but sturdy performances were an asset to each of his chapterplays; had he ever landed a serial vehicle that proved both popular and well-made, he’d enjoy much more acclaim–but the absence of such a vehicle shouldn’t preclude his recognition as a reliable, likable, and highly effective serial hero. Above: Robert Lowery, staying on top of things in Batman and Robin (Columbia, 1949).